Gemstones are so fascinating! their colors properties, myths, and legends are diverse and fascinating. Folklore about stones has been revered and honored for centuries in all cultures. 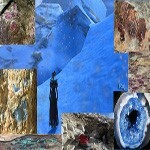 Far back in history Precious Stones have been held in high estimation by all nations. Primarily because of their beauty but also on account of their virtues, as transmitters of good luck and to avert misfortune. The association of Gems with power, civil and religious adds to the mystery in the history of birthstones. Read about the history of diamonds from the Romans to the Middle ages. 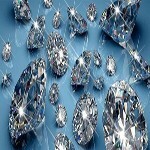 There is also a history timeline about diamonds. It symbolizes strength as it is the hardest substance in the world it is also representation of a lifelong commitment. The word diamond is derived from the Greek word “Adamas” which means indestructible or unconquerable. It is represented power, protection, wealth and bestowed upon a loved one to mark new life together, an engagement for lifelong love. Did you know that diamonds were considered to be a charm? The history of emeralds from the Romans to the Middle ages. Emerald is derived from a Persian word meaning “Green Gem’ it was mined in Egypt as early as 330 BC. It was believed to have many mystical powers that accompanied its beauty, loyalty, new beginnings, peace and security. Did you know that emeralds were considered to be beneficial to the eyes too? The history of turquoise from the Romans to the Middle ages. Did you know that turquoise was once believed to appease hatred, relieve and prevent headaches, and to change colour when its owner was in peril or ill health? The history of pearls from the Romans to the Middle ages. Pearls used as decorative objects in 4th millennium BC Egypt. Pearls have long been long treasured and highly valued in many cultures throughout history it has become a metaphor for something rare, great, admirable and valuable. Natural pearls are almost 100% calcium carbonate and conchiolin. It is also believed that natural pearls form under a set of accidental conditions when a microscopic intruder or parasite enters a bivalve mollusk and settles inside the shell. The history of the aquamarine from the Romans to the Middle ages. Aquamarine is derived from two Latin words: aqua, meaning “water” and marina, meaning “sea”. It is believed that the mineral gives the wearer protection against foes in battle or litigation with unconquerable and amiable energy as well as quickens the intellect power. Did you know that the aquamarine was considered to have the ability to reawaken the love of married couples as well? The history of rubies from the Romans to the Middle ages. The word Ruby is derived from the Latin word “ruber” which means “red” it is the king of precious stones it is a pink to blood-red colored gemstone. It was also a representation of the sun and integrity, devotion, courage, romance, generosity, inspiration, and prosperity. According to legend, warriors implanted rubies under their skin to bring valor in battle. As a talisman, ruby would warn its owner against danger and disaster. It was believed by some ancient cultures to cure blood diseases, stop bleeding, ensure good health and treat indigestion. Did you also know that rubies were once considered to to attract friends and good fortune? The history of peridots from the Romans to the Middle ages. The word Peridot is derived from the Greek word “faridat ” which means “gem” Peridots are one of the few gemstones that come in only one color. It is one of the softest of the hard stones. The crystal structure of the Peridot (magnesium iron silicate) It is believed Peridot is used to enhance prosperity, growth, dignity, fame and protection. Did you know that peridots were once believed to protect the wearer from enchantment and against melancholy and illusion? 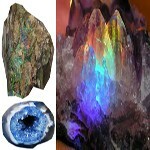 Opal symbolism is as varied as the play of color of the stone itself. 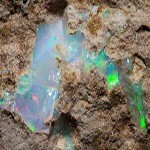 Many believe the opal as a good luck stone. Did you know that opals were once considered to be especially helpful in arresting the glance of envy? 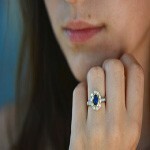 The history of sapphires from the Romans to the Middle ages. Sapphire is derived from the Latin word “saphirus” and the Greek word “sapheiros,” both means blue. The finest quality the sapphire is of a deep blue colour. Buddhists believe sapphire produces a desire for prayer, spiritual Light, and to bring Peace and Happiness as long as the wearer of a sapphire leads a moral life. The Jews and Christians had also held sapphires in high veneration, the seal-stone in the ring of King Solomon was said to have been a Sapphire. The Sapphire was the gem which was selected, as possessing the virtues and qualities essential to its dignified position as the badge of the Pope. Did you know that sapphires are considered to possess the virtues and qualities essential to its dignified position? The history of topaz from the Romans to the Middle ages. Topaz comes from the Sanskrit and means fire. 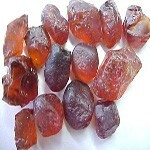 Topaz occurs in a wide range of colors including red, orange, peach, pink, gold and yellow. It preserved the wearer of topaz from sensuality, calmed anger and frenzy, strengthened the intellect, brightened the wit, it gives joyousness and contentment, and drove away broodings and depression. The most famous topaz is a colorless topaz that was originally thought to be a diamond. 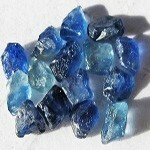 Topaz was thought to heal both physical and mental disorders and prevent death. Did you know that the topaz was once considered to to protect its wearer against perils and dangers in travelling and to avert all complaints of the chest and bowels? Garnet is derived from the Greek word “granatum” which means “pomegranate seed” Garnet is a group of silicate minerals almandine, pyrope, spessartine, grossular, andradite, mozambique and uvarovite, Garnet has been believed to be extremely beneficial in the realm of business. The stone causes people to be attracted to the wearer, which aids in business, as well as in personal success. The strongest virtue of the garnet is to help one overcome depression. It is to mainatain health and cheerfulness, and as a protection against lightning. 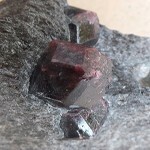 The garnet has ability to warn of approaching danger and trouble by changing its colour. Did you know that the garnet was once believed to increase energy, will power and self image helping all those with a nervous disposition? 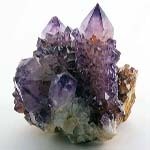 Amethyst is derived from the Greek word “amethystos” which means “remedy” Medieval people believed it indicated the presence of poison by becoming dim, also personal danger and ill health by changing colour; it was, moreover, considered to give vigilance to business men, and to sportsmen and soldiers calmness in danger. It is also believed for a powerful charm against witchcraft, and wearers success to their petitions, good luck and favour with those in authority. Did you know that the Ancient Greeks believed that amethyst would provide protection? Generally, the natural gemstones including diamond, opal, emerald, ruby, sapphire etc. which are precious and valuable. 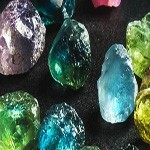 Manmade gems can be divided into four types: the first one is the imitation which is made of plastic,glass; the second one is the imitation which used the fake stone that similar to the real gems; third one is the counterfeit diamond which is made from some chemical synthesis, such as the alumina; the last one is the transparent mineral which is added with pigment in order to pose as gems. These four categories may sound so confusing and will help you to identify the natural gemstone from the fake one. 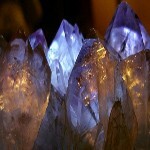 The natural gems have clear and natural lines and can be characterized as cloud and crystal. The manmade gems have no natural lines. No clouds and crystal characteristics, either. The heat transfer of the natural gemstone is slow after being heated. If you touch it,you still feel cool instead of thermal. And the fake one is just the opposite. The rigidity of diamond is 10 degrees, ruby and sapphire is 9 degrees. Other’s rigidity is little low than these two numbers. So here we can take the diamond as touchstone. Choose a site where it will not affect the whole appearance of the gems. Then use the diamond scratch on the site slightly. If there is scratch, then this stone is genuine. The natural gemstones are various in the color, such as red, blue,green, orange, purple, yellow and other colors. Take the ruby for example; the best color for this gemstone is the Pigeon Blood.Examine the natural stone with a magnifying glass, you will find some inclusion and crack inside of the stone. The manmade gems look so pure and unadulterated. You will find bubbles and the trace of casting in it if you look carefully. The natural gems have pleochroism. When you overlook the sapphire in the sunshine, the color you will see is blue. When you observe it from the side view, the color will change into the blue-green. The fake one has no such features. You can some extreme examine methods, such as the fire. The real gems will not fall apart when it is burned in the fire while the fake stone will when the temperature rise to 80 degrees Celsius. If anybody will have interest for further research or want to know or get original pure crystal gemstones through our giftbase program please contact us.